Spinal cord injured individuals with conus–cauda lesions, and as a consequence, denervation of their lower extremities, suffer from severe atrophy (wasting) of their lower limb muscles. After some years, much of the muscle tissue is replaced by fat and connective tissue and secondary problems such as decubitus ulcers, dysfunction of wound healing and osteoporosis can occur. Such denervated muscles experience progressive changes that gradually transform them into tissue incapable of excitation by normal FES (functional electrical stimulation) protocols. This unfortunately prevents some activities such as FES cycling or FES assisted standing that can assist overall fitness and well being. The Stimulette den2x is a compact, high performance, two-channel electrotherapy device that was developed in Austria to be used exclusively for stimulating denervated muscles. Designed for safe home use, it features the latest microprocessor technology, a graphic LCD display and features simple operation by touch sensors. In the 1990‘s, stimulating denervated muscle was seen as promising but controversial by some. During the EU Project RISE, a team of scientists and physicians from Austria, Germany, Italy, United Kingdom, Slovenia and Iceland, acquired essential insights into functional electrical stimulation (FES) of denervated muscles. RISE demonstrated that home-based FES of denervated muscle is an effective therapy that results in the rescue of muscle mass and restoration of tetanic contractility - even after many years of denervation. This project and the subsequent product development, are founded on more than 20 years research in Austria. As you may know, spinal cord injury causes muscle wasting and loss of function. This is particularly severe when the spinal cord injury is at a level that causes damage to the lower motor neurons. Some years after injury, much of the previous muscle tissue is replaced by fat and connective tissue. At this point secondary problems such as decubitus ulcers, dysfunction of wound healing and osteoporosis can occur. So called denervated muscles will experience progressive changes that gradually transform them into tissue incapable of excitation by normal FES (functional electrical stimulation) protocols. This denervation unfortunately prevents some activities such as FES cycling or FES assisted standing that can help ensure overall fitness and long-term well being. Exercise is good for long term health and involvement of the legs is very important to the promotion of healthy circulation. The Stimulette den2x was specifically designed for the purpose of restoring complete or partially denervated muscles. The technology requires large surface electrodes and markedly different patterns of stimulation energy than would normally be found in FES units. The energy delivered to the muscles is of relatively high energy and long duration impulses. This is sufficient to directly elicit contraction of denervated muscles (that have an absence of nerve endings). 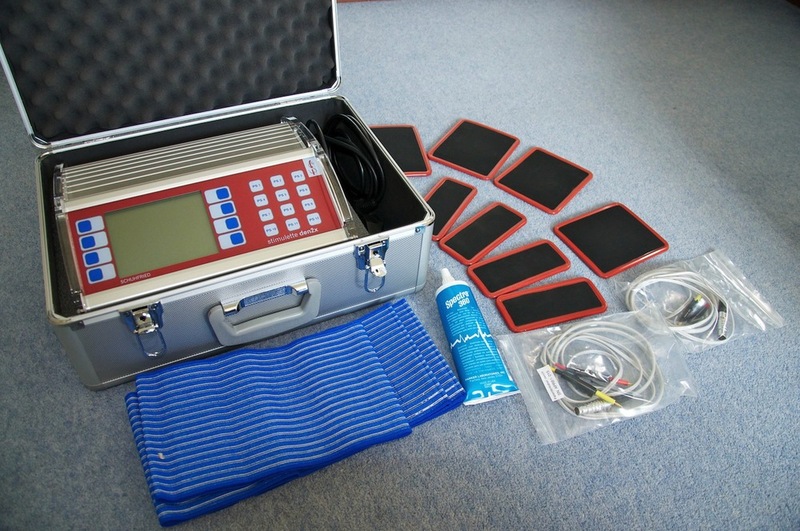 The nature of the stimulation is that only these large, custom made electrodes must be used. These electrodes need to be replaced every three months to ensure safe operation. In use the electrodes are coated with electrode gel and held in close contact with the limbs with elasticated wraps. After some years, much of the tissue of denervated muscle is replaced by fat and connective tissue and secondary problems such as decubitus ulcers, dysfunction of wound healing and osteoporosis can occur. Such denervated muscle is incapable of excitation by normal FES (functional electrical stimulation) protocols. This unfortunately prevents some activities such as FES cycling or standing that can assist overall fitness and well being. By using the den2x, clients can achieve some direct and indirect benefits with consistent use. "Home Based Functional Electrical Stimulation Rescues Permanently Denervated Muscles in Paraplegic Patients with Complete Lower Motor Neuron Lesions"
in Neurorehabilitation and Neural Repair 24(8), 709-721.